– or how I got hooked on designing jewellery and sculptures. I got a first taste of silver-smithing when I visited a weekend course at “In the Studio” in Kegworth which is run by jewellery designer Teresa Speer (and now has moved to Spain where she teaches). In this course I designed my first copper pendant and a silver ring with a Paua shell cabochon. I really enjoyed the course and decided to enrol on a part-time City & Guilds course “3D Studies (Jewellery)”at Cardiff’s Coleg Glan Hafren. 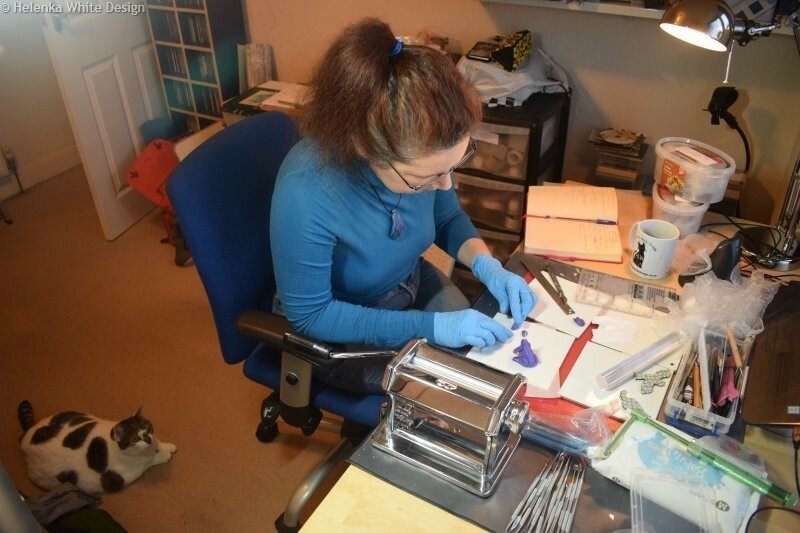 The course went on for a year and gradually I bought the necessary tools and my own work bench in order to be able to finish my assignments at home. I learned to work with Precious Metal Clay (PMC) at the Mid Cornwall School of Jewellery Making in Par where I spent a weekend attending the beginner’s course. I am now mostly teaching myself from books and simply experimenting, but am always looking to improve my skills and go on other courses. I love working with all sorts of materials. Swarovski Elements are perfect for rings, earrings and tiaras, while PMC (Precious Metal Clay) is simply lovely to work with. I also love working with polymer clay as it is an incredibly versatile medium. I also like using Czech fire-polished beads and semi-precious beads. My favourite semi-precious beads are Lapis Lazuli, Malachite, Agate, Labradorite and Tiger Eye. My inspiration comes from all sorts of sources, sometimes just playing around with different types of beads, doodling in my sketch book and also from our gorgeous cat Bobby. I like animals and decided to specialise in animal-themed jewellery. A few years ago I started using polymer clay to create small animal sculptures. I love sculpting- it’s challenging and fun. On my long to do list is to create human sculptures too. I have also started to paint and draw, skills I want to improve and will be useful for my design work. When I am not writing, sculpting or creating jewellery I enjoy cuddling our gorgeous cat Bobby, who is my muse and makes sure that I take enough breaks. It’s therefore not surprising that cats frequently crop up in my designs as you can see here. I also write on my blog at Helens Paws for Thought. You can find my articles for making Jewellery here. Working at my craft table. Our Bobby is often with me – either snoozing or watching. 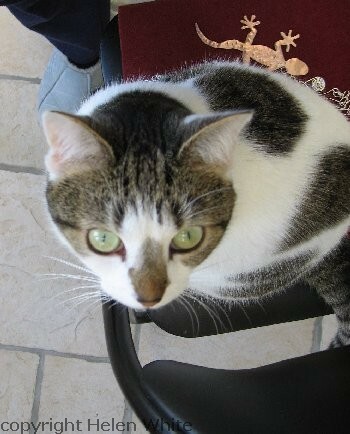 Our cat Bobby – my little muse and boss. 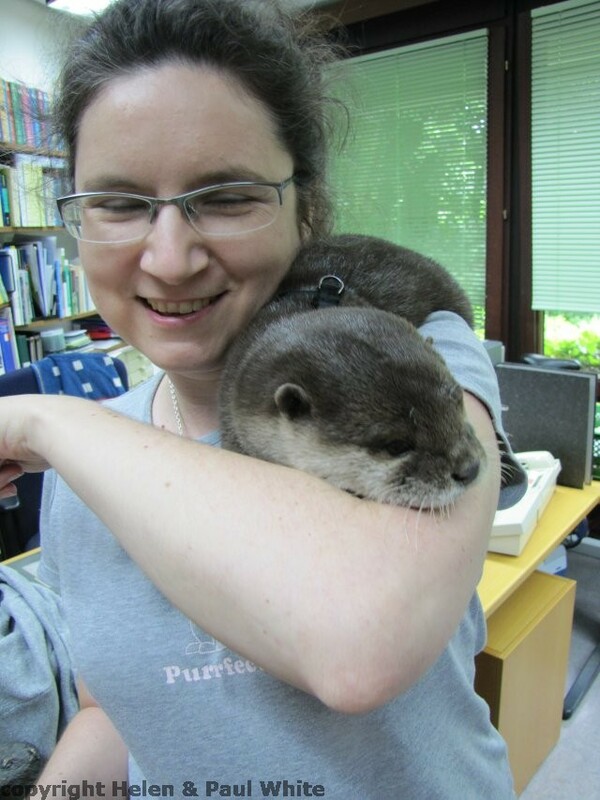 PS: If you want to know who the otter on my arm in the photo on the top is – check out my blog post about meeting Nemo here.